Momma Told Me: Somewhere over the rainbow. Ever since I was a wee little lass I've been enamored with color. 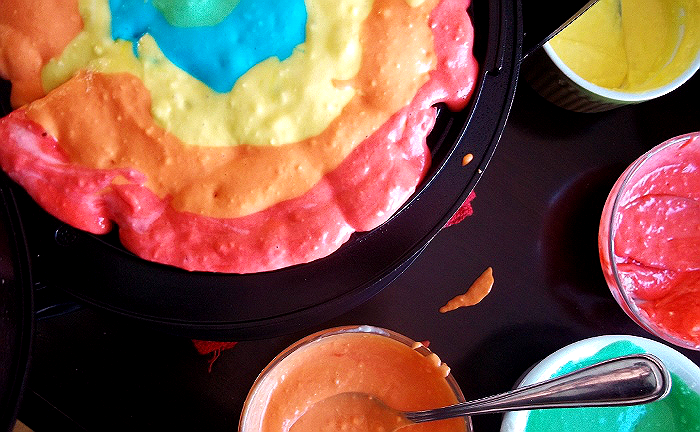 It's true, most young children first learn sensory play with primary colors and finger paints, and when Easter rolls around they enjoy dipping eggs in colored dyes to create wondrous new colors. But I outlived this phase far beyond Pre-K and Elementary. When birthdays would roll around I'd demand money for the local craft store, where I could buy the latest paints and markers, and even endured a (now quite embarrassing) tie-dye phase at age 12. For quite some time, in fact, my entire room was a riot of color, tie-dyed bedding and drapes, and a crayon box full of colorful animals on my bed. Then there were the home made lava lamps for the state science fair, and the beginning of what has become a lifetime of unnatural hair colors. Yes, color makes me happy, quite literally. I cannot pass by a bouquet of rainbow colored daisies without stopping for several moments to admire them and think a warm though. I will wear neon printed socks with bone white bowling shoes and capris, and nothing makes me happier than seeing a riot of color combined with food. That is why I am so very happy we are entering Spring, one of the most colorful times of the year for naturally vibrant edibles. And, while I am certain there will be many visits to the Pick-Your-Own-Farm in our future, I simply can't wait for the fresh berries and produce to start rolling in. I have several colorful food tricks up my sleeve to celebrate April Fools and St Patrick's Day, so be sure to tune in often! Today's idea was a marriage of breakfast food, which seems to be a guilty pleasure and 'happy food' for many, and the lesser celebrated hero of St.Patrick's Day, the rainbow. It's true, there are millions of naturally occurring colors and sights in this world, but few are as rare and individually unique as a rainbow. March is often full of green, but what about the beautiful prisms of colored light that lead to the leprechaun's gold? Are they not worth celebrating too? 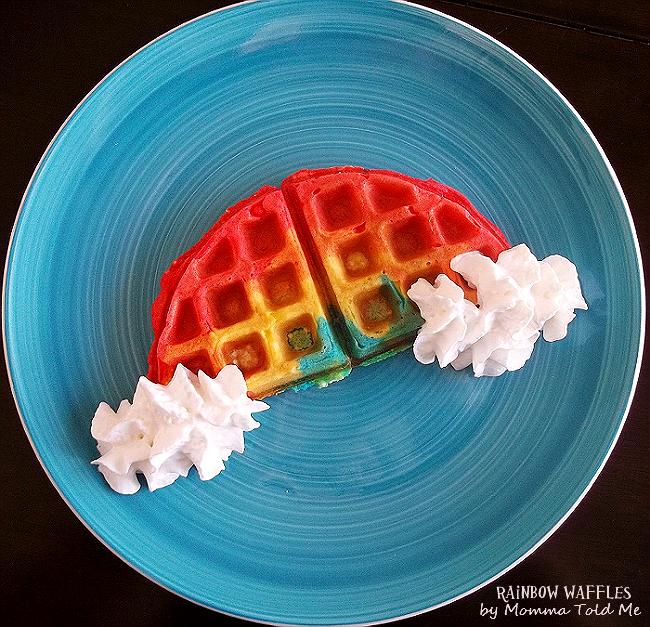 So, this March I offer you a Green Eggs and Ham alternate (heck, serve these alongside if you dare); Rainbow Waffles, complete with whipped cream clouds! It's actually simpler to achieve than you might think; though there are several tips you can use to maximize your results and make the process less messy. If you have piping or condiment bottles you can use these to pour your rings of colored batter into the griddle (I spooned them and it turned out okay.) You will want your batter thicker, to prevent running, and should start inward out. For the first few waffles try doing one half of the griddle at a time, this will take the pressure off you as the batter begins to spread. Additionally, remember that your middle two colors will require significantly less batter than the outer red and orange. 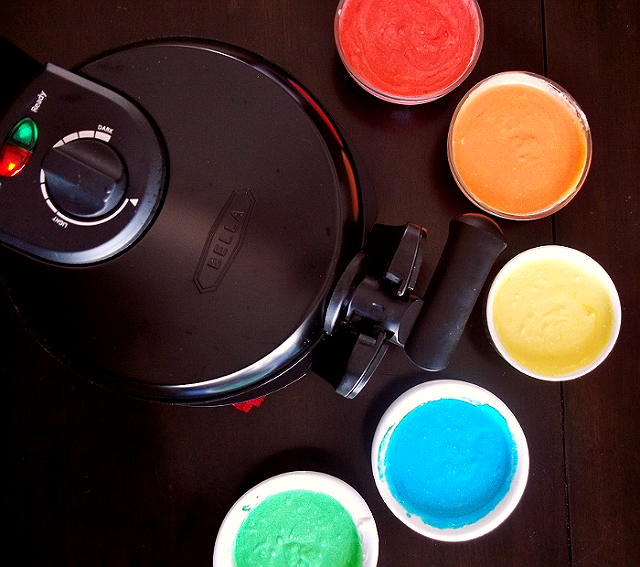 When you are separating your batter to color it, keep this in mind, otherwise you will have quite a lot of green and blue when you are done! When I was a little girl, waffles were one of my favorite breakfast foods, but certainly one of Momma's least. Let's face it, a bowl of cereal was much simpler than hauling out the waffle iron, waiting for it to preheat, and cleaning up the waffle run-off mess when she was done. During the Summer I'd get especially antsy for Momma to pull out one of her famed 'waffle breakfast' days, and would sometimes go weeks asking over and over "Where are the waffles?" One morning, as I peered sullen over my Cocoa Puffs, I let out a loud sigh and asked the question again, "Mom, where are the waffles?" With a stern hand on her hip and pursed lips, it was obvious I was about to get a scolding. Instead, a smirk began to part her mouth, and she calmly replied, "Somewhere over the rainbow, that's where!" As visions of munchkins and the classic song began running through my mind, it was hard to stay mad, myself. I quickly began to giggle. 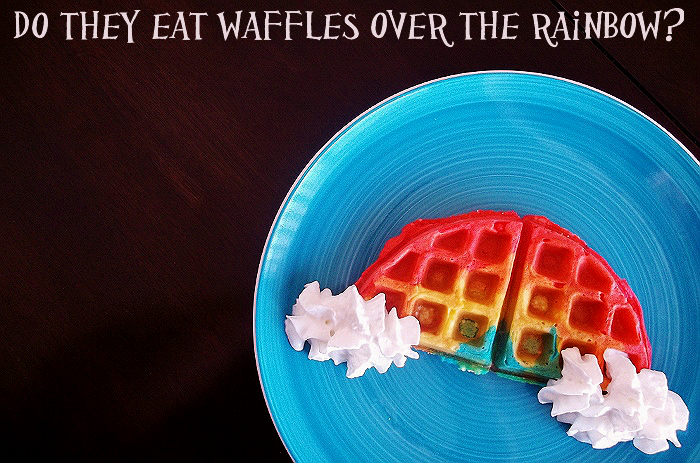 To this day, when I see waffles I think of Momma, munchkins, flying monkeys, and rainbows. What Daughter Says: I don't know if they eat waffles in Oz, but they're welcome at my table any time! I've never seen waffles that pretty before! And that's a cute story, too. 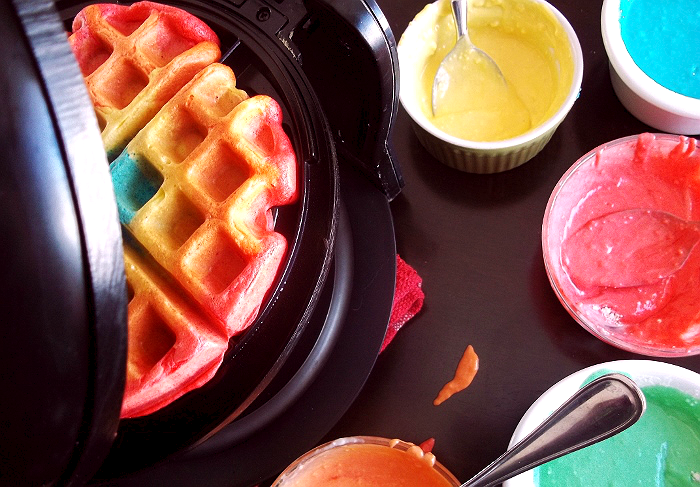 Very colorful waffles. Now see your Momma should have done what I do for my hubby; I make a double batch at a time and freeze them. Then he just warms one up in the morning and he has a waffle every day for breakfast! I only have to make them once every two weeks. Your Momma is a pip! What a sweet way to remember your mom. Those are the prettiest waffles I've ever seen. Butterflies remind me of my mom. That is a beautiful story about you and your Mom. Plus those waffles are beautiful. I always love seeing what recipes you come up with. They are always so creative. When I get rich I swear I am hiring you to be my food blogger. You are the most creative person ever. 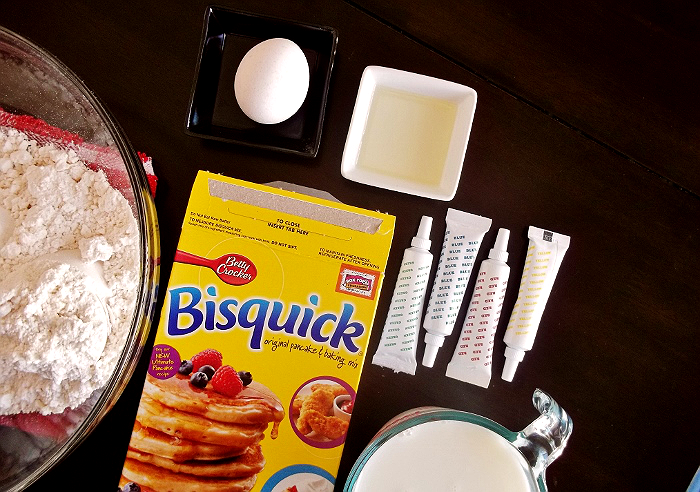 Love the look of this bisquick inspried food!